A new hotel is set for Warwick after a masterplan for a “unique visitor attraction” was given the green light last night (Wednesday). The extensive plans for the popular sporting and recreational facility at St Mary’s Lands are the outcome of a two year consultation process with the St Mary’s Lands Working Party which is made up of the Corp of Drums, Friends of St. Mary’s Lands, Golf Centre, Hill Close Gardens, Warwick Race Course, Racing Club Warwick Football Club, Warwick Town Council, Warwickshire County Council and the Warwick Society. Now that the masterplan has been approved a delivery plan for the area will be put into action later this year. This will see improvements to the landscape and drainage to increase biodiversity, enhancement to the frontage of Hill Close Gardens, a cycle link from Hampton Road to Saltisford Brook, improvements to pedestrian access, footpaths and parking, a new play area adjacent to the Forbes estate and modifications to the toilet facilities at both the Golf Club and Racing Club Warwick to allow for public access. Councillors also endorsed the inclusion of a hotel as part of the plans following a feasibility study on the economic benefits it could bring to the town. Plans for a hotel on the land have been put forward before, with strong objections from local residents. It is thought the hotel would be located at the southern end of the Grandstand area. A report on the hotel proposal will be brought to the Executive later this year on how the hotel proposal may be brought forward for implementation. It was also suggested that there could be a possible public consultation to help name the site. 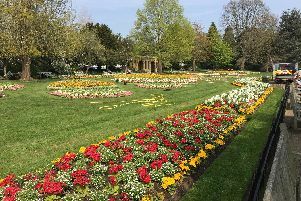 Councillor Noel Butler, who is an Executive member of the District Council and a member of the St Mary’s Lands working party, said: “With its nature reserve, Grade II listed gardens, racecourse, football and golf club- St Mary’s Lands is an integral part of our community.